A short walk from a thriving local centre, these homes will appeal to a range of purchasers seeking a low maintenance, superbly efficient home with a high specification. 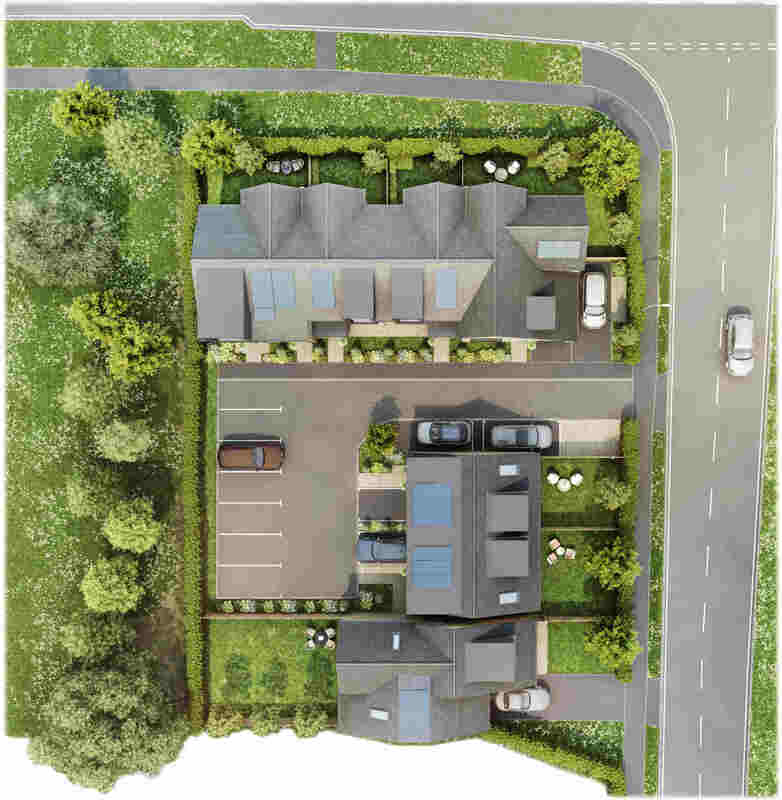 The clever design has created a range of 2, 3 and 4 bedroom homes, arranged over 2 or 3 storeys, including a superb apartment of over 1100 square feet. Off road parking for all the homes has been cleverly incorporated, creating 2 parking spaces for all the houses, some with garaging too. Another key design feature is all the homes, bar one, has a private garden space. It’s hard to think of a better location! Our homes at St Thomas More are a short, level walk from a thriving local centre and yet within minutes you can be in the heart of historic Winchester or entering the magnificent South Downs National Park. The nearby Stockbridge Road and Stoney Lane have excellent bus services and you are moments from a plethora of local shops, services and food outlets such as the Post Office, Aldi, Waitrose, Boots, etc. If you’re looking for clubs, societies, hobbies or children’s groups, you’ll find plenty in the local area too. Winchester is on the doorstep of the beautiful South Downs National Park, a wonderful place to enjoy walking, mountain biking, horse riding and family days out. A day on the coast is around 30 minutes’ drive with a choice of beaches and plenty of sailing clubs for the more nautically minded. If you’re a keen shopper, you’ll love the variety and diversity Winchester has to offer. There are an abundance of designer brands, high street favourites and independent boutiques to wander round, nestled between the galleries and antique shops. The city is famous for its rich array of markets and activities – whatever you’re in the market for, you’ll find it here. Amonthly antiques market draws treasure-hunters from far and wide, while creative types flock to the regular art and design market. There’s also our famous Hat Fair that fills thehistoric streets with entertainers and artists from around the world for a week each summer. And a popular music festival, Blissfields, that is growing year on year. The city is fast becoming renowned as a foodie haven, and there are plenty of gastronomic delights to discover at Winchester Farmers’ Market. It’s one of the largest in Europe, and you’ll find everything from a humble loaf of bread, to a rare slice of buffalo. Every Wednesday, ‘A Taste of the South’ food market offers local delicacies from the south of England. So it’s easy and exciting to find amazing things to serve when friends come over for dinner. If you’d prefer to dine out, there are plenty of options to choose from: from historic dining rooms like The Chesil Rectory, serving gourmet British fare, to international cuisines such as sushi, Thai, Indian and Spanish, and Michelin-starred restaurant The Black Rat. Even world renowned chefs can be found here, with Hugh Fearnley Whittingstall’s River Cottage Canteen, Raymond Blanc’s Brasserie Blanc and Rick Stein’s eponymous restaurant all in residence. Once you’ve sampled the local delicacies, there are plenty of quirky pubs, wine bars, olde inns and riverside beer gardens to keep you entertained well into the night. For the culture vulture there is plenty to enjoy. Once the capital city of King Alfred the Great, Winchester is steeped in history. Historic buildings include the awe inspiring cathedral, one of the largest in Europe, and the historic Winchester College, the oldest public school in the country and open for public tours. The city has a bustling Arts scene, including its independent cinema and two theatres. It’s easy to understand why for many Winchester is quite simply the jewel in the south coast’s crown. Winchester has an excellent selection of schools within easy reach. St Thomas More sits in the catchment area for five primary schools, the closest being Weeke Primary (0.2 miles) with Harestock Primary and The Westgate School (0.7 miles) also in easy reach. At secondary level, Henry Beaufort School is 0.8 miles away, The Westgate School 0.8 miles, while Kings’ School is 1.9 miles, and was rated ‘Outstanding’ by Ofsted in June 2014. In the independent sector, the prestigious Winchester College is just 1.9 miles away, with St Swithun’s also nearby. For further education, the ‘Outstanding’ Peter Symonds Sixth Form College is 0.7 miles away from St Thomas More. While you’ll have everything you need on your doorstep, you’re perfectly located for going further afield. The M3 is a short drive from St Thomas More, connecting you to London, and to the south coast and beyond. The A33 and A34, both major routes, are also within easy reach. For train travel, St Thomas More is just 0.6 miles from Winchester station. By train, London Waterloo is just under an hour away, Southampton Airport Parkway just 7 minutes and Bournemouth 47 minutes. While your nearest major airport, Heathrow, can be reached in under an hour by car. Contemporary four bedroom terraced house with 27 ft open-plan kitchen/dining/living area. HELP TO BUY AVAILABLE. Reserve in April and we will pay your SDLT. Contemporary two bedroom apartment with generous, private garden. HELP TO BUY AVAILABLE.